Ιατρόν και ποιμένα, Λουκά τιμήσωμεν, * Συμφερουπόλεως ποίμνης, Αρχιερέα λαμπρόν, * τον βαστάσαντα Χριστού τα θεία στίγματα, * τας εξορίας, τα δεινά, * εγκλεισμούς εν φυλακαίς, τας θλίψεις και τα ονείδη, * τον επ' εσχάτων φανέντα, εν τη Ρωσία νέον Άγιον. 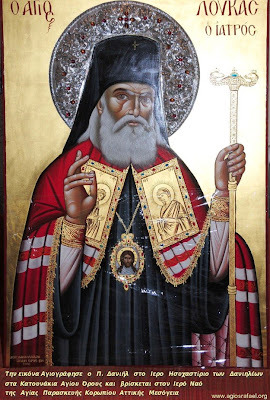 O physician and shepherd, let us all honor Luke, as Simferopol's shepherd and a radiant Archpriest, who bore Christ's divine marks, exiles, dangers, being locked within prisons, tribulations and persecution, for in the last days has shown forth, in Russia a new Saint. His story is truly inspirational, and I hope to include a brief overview (translated, excerpted and summarized from the following book and the links at the bottom of the page, and elsewhere). For the full story of his life, see: The Blessed Surgeon: The Life of Saint Luke Archbishop of Simferopol by Archdeacon Vasiliy Marushchak (available here: http://www.monasteryofstjohnstore.org/?page=shop/flypage&wt=0.99&product_id=15&CLSN_3049=124214829030490322b1070de28da4a3). Other summaries of St. Luke's life is available in English here: http://www.stjohndc.org/Russian/saints/e_0609_luke_vj.htm, http://orthodoxwiki.org/Luke_(Voino-Yasenetsky)_of_Simferopol_and_Crimea, and http://www.impantokratoros.gr/st_luke_doctor.en.aspx. In 1904, the Russo-Japanese War brought Valentine to the Far East as a surgeon, where he met his future wife Anna Vasilievna Lanskaya. They married and had four children. 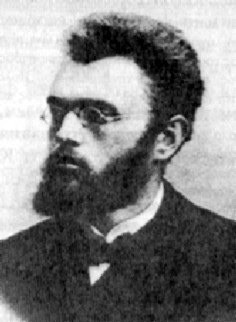 During this time, as a surgeon, Valentine became specially trained in opthamological operations, along with regional anesthesia and the surgery of pyogenic infections (which later became areas of research for him). He also displayed immense faith in those difficult times. The family would entertain a nun from the Fiodorovski monastery once a month, and they would attending church regularly. Valentine would also refuse to perform an operation without first praying before an icon of the Theotokos in the operating room, and then signing the patient with iodine in the sign of the Cross. In fact, one time the Communist Party officials removed the icon, at which point Valentine refused to return to surgery until it would be returned. Soon, the wife of one of the party officials needed an operation, and specifically requested Valentine. He, however, refused to perform the surgery until the icon of the Panagia was returned. They complied with his request, and he returned to surgery. Valentine's wife, who came down with tuberculosis, died prematurely. Though Valentine grieved deeply for his wife, he was able to see the hand of the Lord guiding him even through this difficult time, both by Him choosing one of the nurses to help raise his children, and by calling him to the priesthood. In obedience to Archbishop Innocent, Valentine hastily followed Christ's divine call, and was ordained a deacon on January 26th, and a priest on February 2nd, 1921. In fact, because of the need for a bishop, Fr. Valentine also obeyed the call of the people and underwent the monastic tonsure (being given the name "Luke", after the Evangelist whom he resembled) and was consecrated a bishop. This period of time was extremely difficult for the Russian Orthodox Church, as they were constantely being assulted from the right (zealots and schismatics) and from the left (the athiest government and their heretical "Living Church"). Because of St. Luke's confessions of faith (and despite his immense medical and scientific achievements), he was imprisoned, tortured, and exiled for 11 years in total to Siberia, and other trecherous locales. Besides persecution from the government, he had to deal with heretics from the "Living Church" who masqueraded as Orthodoxy and drew people away from the Church, and schismatic individuals who also caused unneeded harm in those turbulent years. St. Luke's virtues, struggles and achievements are staggering. 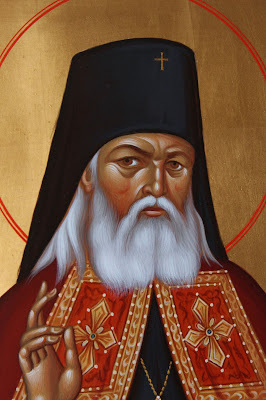 As a Grace-filled hierarch of the Church, he re-opening many churches that had been closed by the Communists, produced deep theologic works, and supported the faithful while drawing many to Orthodoxy. In addition, his love, skill and devotion to his patients saved thousands, (especially injured soldiers in war), and his research techniques were award-winning, and were claimed to be important to his fellow surgeons fifty years later. 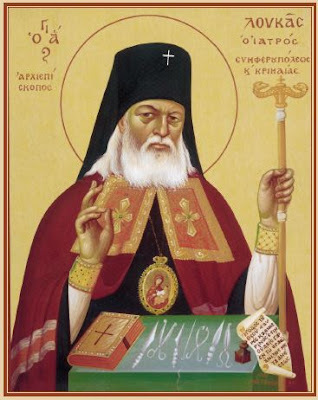 After a lifetime of such medical accomplishments and spiritual struggles in his confession for the Faith, St. Luke reposed in the Lord as the Archbishop of Simferopol (Crimea) on June 11th (New Calendar) 1961. 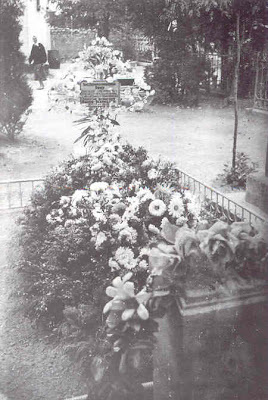 On March 17th 1996, St. Luke's remains were disinterred, with an estimated 40,000 people taking part. It is said that an indescribable aroma arouse from his relics, while his heart was discovered incorrupt, a testament to the great love he bore towards Christ and his fellow men. 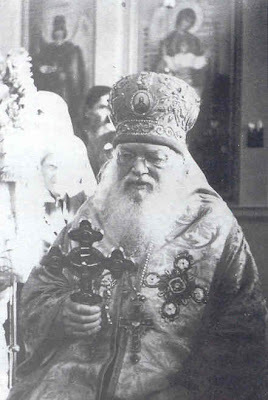 Three days later on March 20th 1996, his relics were transferred to the Church of the Holy Trinity. The Church of the Holy Trinity and the Tomb of St. Luke have become a great pilgrimage for the world. Many from Russia, Ukraine, Greece, and beyond flock to not only the Tomb and Relics of this great Saint, but to visit many of the other churches and cities visited by St. Luke during his travels and exiles. Many miracles occur through his prayers throughout the world. 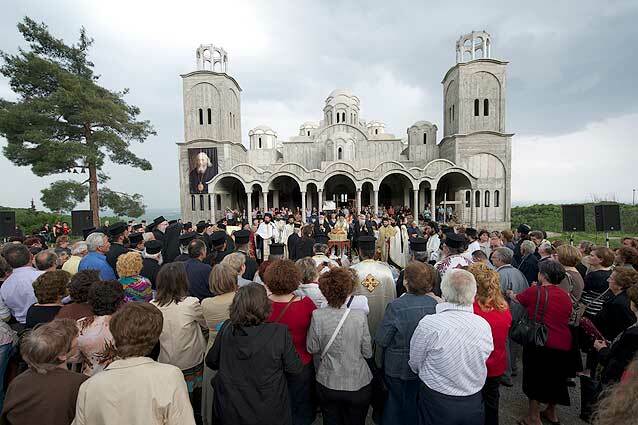 Besides being beloved in Russia and the Ukraine, St. Luke is also very well-loved in Greece. Specifically, the life of St. Luke, written by Archimandrite and Abbot of the Monastery of Sagmata, Fr. Nektarios Antonopoulos, has sold thousands of copies, and is in its 14th edition of printing. Many churches (some of them quite large) have been built in honor of St. Luke of Simferopol in Greece alone in recent years. One incredible miracle involved a young boy named Nazar who was an excellent piano player. The tips of three of his fingers were cut off accidentally, and he was afraid that he would never be able to play piano again. After he and his grandmother prayed to St. Luke to help him, his fingers began to spontaneously regrow, and in 10 days, were totally normal! Today, the boy plays better with that hand than his other, unaffected hand. Some of St. Luke's most notable pilgrimages include: the Holy Trinity Church, Simferopol, Ukraine (where they treasure the majority of the Saint's relics, along with his wonderworking tomb), The Monastery of the Transfiguration, Sagmata, outside of Thebes, Greece (where they have a chapel and holy relics of the Saint, and many of his personal articles; see: http://www.youtube.com/watch?v=v6kh7VVFMog)), and the Monastery of Panagia Dobra, Veria, Greece (where they treasure a large relic of the Saint, and where I believe they are building the first large church of the Saint in the world; Note that every Tuesday evening they hold Vespers and Paraklesis to St. Luke. 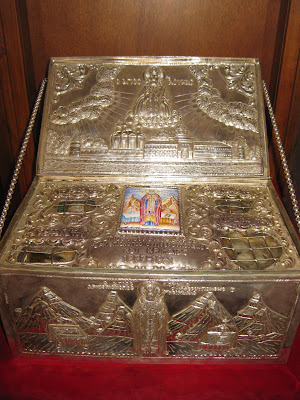 Other chapels / holy relics of St. Luke include: the Military Medical Academy, Belgrade, Serbia, the Church of Panagia Evangelistria, Piraeus, Greece (where in the chapel of St. Luke they hold Vespers and Paraklesis to the Saint every Sunday evening), The Monastery of the Transfiguration, Dryovouno-Kozani (http://www.agiosloukas.org/Iera_Moni_Metamorfoseos_Sotiros.html), and St. Basil the Great Orthodox Church, USA (ROCOR) (http://stbasilthegreat.org/). -"The Spiritual Testament" of St. Luke (in Greek): http://apantaortodoxias.blogspot.com/2009/06/blog-post_28.html. 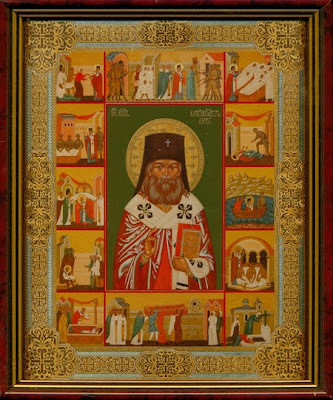 -Orthodox Wiki Page on St. Luke: http://orthodoxwiki.org/Luke_(Voino-Yasenetsky)_of_Simferopol_and_Crimea. -An article by St. Luke on Science and Religion, translated into English: http://www.impantokratoros.gr/8C1597E5.en.aspx. -A talk by Fr. 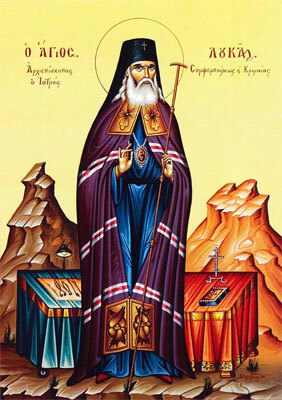 Nektarios Antonopoulos on St. Luke (in Greek): http://www.i-m-patron.gr/news1/news_2010/260410_osios_loukas_nekt_antwnvid.html. The transcript of the talk in English and Greek is available here, respectively: http://www.impantokratoros.gr/st_luke_doctor.en.aspx, http://www.impantokratoros.gr/agios_loukas_symferoupoleos.el.aspx. -A very comprehensive, commonly updated page about St. Luke in Greek: http://agiosloukas.org/ . 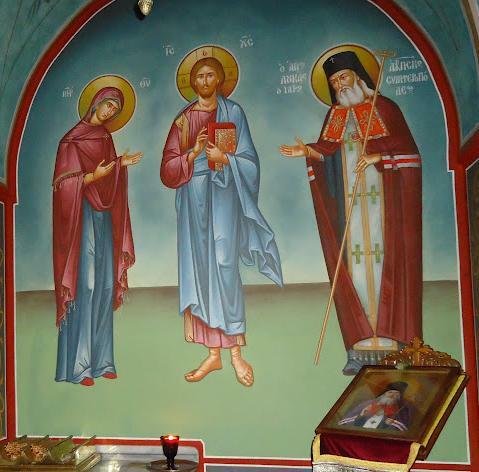 -Many pictures of St. Luke (along with other Saints and Icons): http://www.rel.gr/photo/thumbnails.php?album=59. 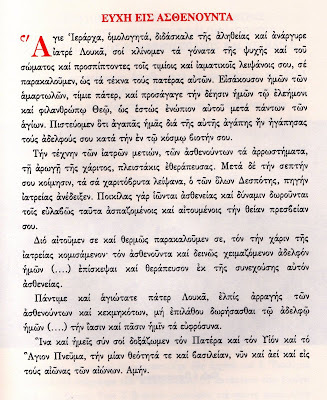 -Another page about St. Luke in Greek, summarizing his life: http://orthodox-world.pblogs.gr/2008/05/o-agios-loykas-symferoypolews-enas-syghronos-megalos-agios.html. -Wiki page about St. Luke in Greek: http://el.wikipedia.org/wiki/%CE%86%CE%B3%CE%B9%CE%BF%CF%82_%CE%9B%CE%BF%CF%85%CE%BA%CE%AC%CF%82_%CE%A3%CF%85%CE%BC%CF%86%CE%B5%CF%81%CE%BF%CF%85%CF%80%CF%8C%CE%BB%CE%B5%CF%89%CF%82. -Paraklesis to St. Luke of Simferopol (in Greek) chanted by the Fathers of the Monastery of Panagia Dobra: http://www.youtube.com/watch?v=lug3f_UEX7E. 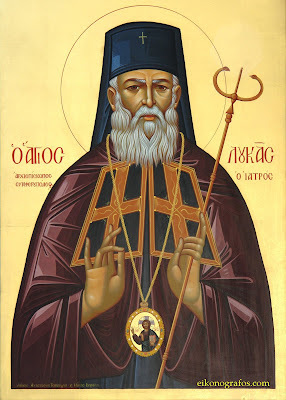 O holy Hierarch, confessor, teacher of the truth and unmercenary physician Luke, we bend the knees of our souls and bodies and fall before your precious and healing relics, and we entreat you, as children to their father. Hearken unto us sinners, O precious father, and present our entreaty to the merciful God Who loves mankind, for you are before Him with all the saints. We believe that you love us for with this love you loved your brothers during your earthly life. For using the art of medicine, you healed all manner of illnesses of the sick, with the help of grace. And after your sacred repose, the Master of all showed your grace-flowing relics to be a spring of healing. For various diseases are healed, and power is granted to those who piously embrace them and entreat your divine intercession. Therefore we entreat you and fervently ask of you, who were granted the grace of healing: visit and heal our sick and terribly needy brother/sister/bretherin (name) from his/her/their continuing sickness. All-precious and most-holy father Luke, the steady hope of the sick and troubled, do not neglect to grant our brother/sister/bretherin (name) healing and all good things. That we might with you glorify the Father and the Son and the Holy Spirit, the one godhead and kingdom, now and forever and to the ages of ages. Amen. "I am the resurrection and the life. He who believes in me will live, even though he dies; and whoever lives and believes in me will never die." "Lazarus, come out!" St. Luke, pray for us, to carry all illnesses, diseases and infirmities in my son, nieces, nephews, godchild (parents, grandparents, greatgrandparents (step)) for cleansing, healing, deliverance.